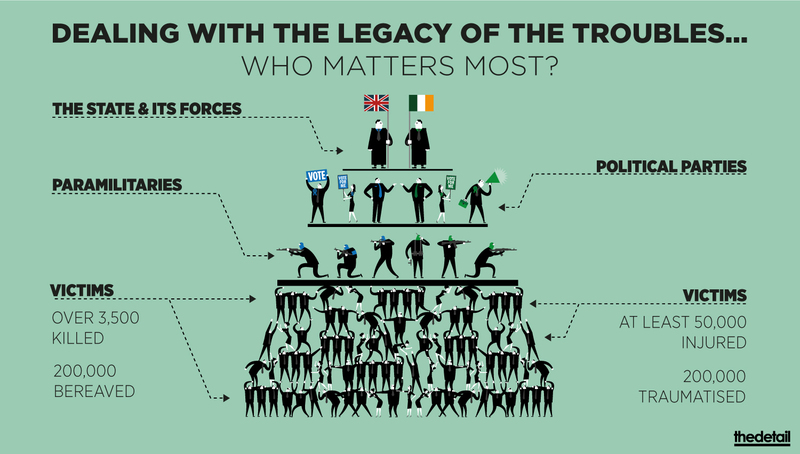 On the third and final day of 'Imaging NI', a major project using infographics to tackle political issues in Northern Ireland, The Detail's Steven McCaffery looks at the legacy of the Troubles and life in our schools. IF THE last 20 years was about ending the violence of the Troubles and creating political structures to help enemies share power - what's next? It seems that the heavy lifting now involves creating a society at peace with itself. And the key tasks will be dealing with the fallout from decades of violence, plus tackling divisions in the education system. But they could be the toughest tasks of all. Down through the centuries violence has repeatedly flared up and then receded here. At no other point during a lull in tensions has the north of Ireland been able to fully reconcile itself to its past and carve-out a shared vision for the future. During the Troubles it was widely believed that there was a grotesque hierarchy of victims, prioritising some deaths over others. But since large-scale violence ended, a new hierarchy has emerged. When it came to dealing with the legacy of the conflict, the interests of victims have not always been paramount. Despite numerous honourable attempts to deal with the past, political leaders - including the British and Irish governments - repeatedly failed to deliver. The Eames/Bradley report of 2009 mapped-out complex architecture that offered a holistic approach to deal with the legacy of the Troubles - but it was effectively binned by government. Political crises forced a fresh attempt in 2013 under the chairmanship of US diplomat Richard Haass, but when he also recommended a deal on the past, it too fell by the wayside. In the most recent negotiations late last year, London and Dublin led talks that delivered the Stormont House Agreement, containing a slimmed-down version of what had been previously proposed for legacy issues. The agreement includes plans to investigate unsolved murders, source new information on killings, and attempt to heal society's wounds. But the British and Irish governments face questions over the past. They each have a vested interest in how it is examined, as was previously reported by The Detail here. Political parties have also been accused of putting their interests first. Meanwhile, paramilitary groups continue to exert influence on how the Troubles are dealt with. Then there are the victims. The justice system is creaking under the strain of handling numerous legacy cases, while Northern Ireland's fragile political structures are regularly tested by disputes over the Troubles. Some elements of the Stormont House deal are already fraying at the edges. Will its pledges on the past be made to stick? To view the infographic in full click on the image. Observers from outside Northern Ireland are often shocked by the depth of divisions here. The network of peacewalls between some Catholic and Protestant communities and the religious split in schools are the two things that are often cited by new arrivals. Visitors ask why more progress has not been made, especially in education. But the divisions in education are many and varied. The religious divide justifiably grabs attention, but social divisions routinely slip from the debate. Social division is at the heart of the row over the use of testing to select 11 year-old pupils for either grammar or secondary schools. The data highlights how grammar schools have a smaller proportion of pupils who are entitled to free school meals, which is a common measure of deprivation. The system affects disadvantaged children from all communities, though the poor exam results of Protestant boys have been highlighted for concern. This issue is raised by the Northern Ireland Children's Commissioner in a separate story published by The Detail today. Academic selection is seen as reinforcing social division, but the issue is ‘stuck’ at the centre of a deeply politicised argument between the DUP and Sinn Féin. Meanwhile, schools face a string of other challenges and divisions. But, just as with the legacy of the Troubles, efforts to tackle divisions in schools have moved slowly. 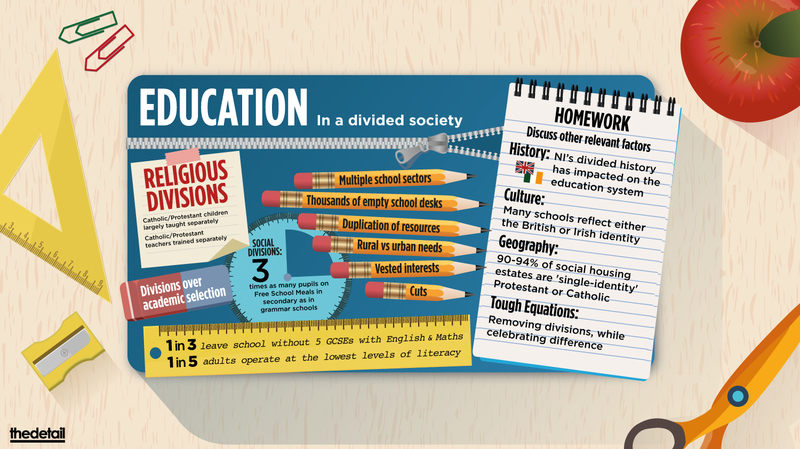 There is a deep religious divide in the education system that dates back to the foundation of the Northern Ireland state, with Protestant and Catholic children still largely taught apart. Despite decades of campaigning for fully integrated education, only 7% of children attend integrated schools. The introduction of shared education, where pupils can meet peers from other traditions or share facilities, is an alternative that has secured backing from Stormont. But the divisions are multi-layered. Religion in Northern Ireland often indicates political identity. Schools can reflect the British or Irish identities of the communities they serve. The fact that many unionist and nationalist communities live apart from one another is a further barrier to integration in schools, while rural areas may face different challenges than those found in urban settings. Should factors such as identity, geography, and economic disadvantage – all of which contribute to division – find a place in the debate on integrating education? And how is all this to be achieved, while protecting diversity? 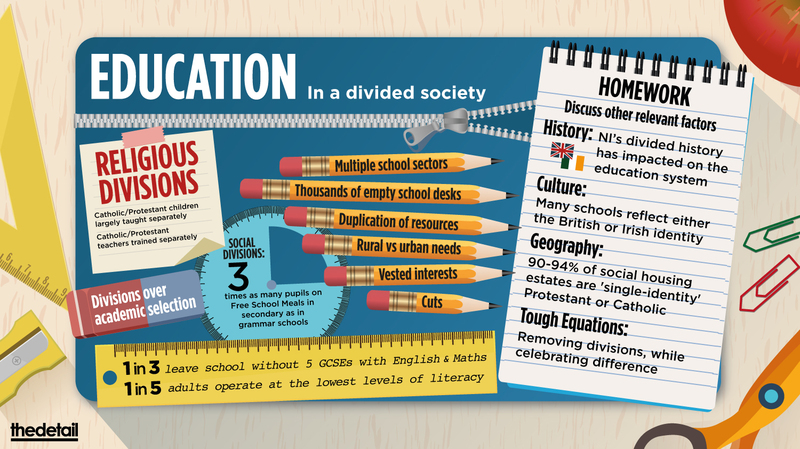 Northern Ireland’s deeply divided society faces major hurdles if it is to deliver substantial change in education. The imaging NI project has produced infographics on a series of key issues. It looked at Demographic shifts inside Northern Ireland, the society's increased diversity, plus the political pressures outside its borders. The supposed 'culture war' that is blocking political progress was examined. And the past and the future - dealing with the history of violence and the challenges in education- were considered. The project highlighted issues that the political system is refusing to face, but which could have a major impact on the future. It also covered some of the well known stumbling blocks to progress here, but showed how the facts suggest compromise should be within reach. Most importantly, the infographics illustrate the opportunity that exists for new thinking.